now after 1600 km alone Astrid and me are cycling together. we met many Russian cyclists and after 95 km we found a camping site what was in no good condition. no showers no toilets but many moskitos. 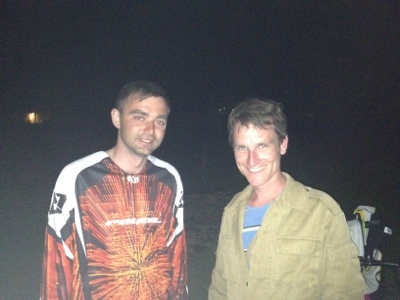 good to have Autan.... . on the camping site there came two Russians with bike, too. we had a glas of wine together and it was very funny.